On Monday, Navdeep Bains, Minister of Innovation, Science and Economic Development, and the Minister responsible for the Canadian Space Agency (CSA), announced that Canadian astronaut David Saint-Jacques has been assigned to a six-month mission aboard the International Space Station (ISS). Saint-Jacques will launch aboard a Russian Soyuz rocket in November 2018 to join an international crew onboard the orbiting laboratory. Expedition 58/59 will be the first mission for David Saint-Jacques and will mark the 17th space flight for the Canadian Astronaut Corps. During his time in space, the astronaut will conduct a series of scientific experiments, robotics tasks and technology demonstrations, the details of which will be revealed later this year. In addition to his extensive training, the Quebec native will bring his expertise in medicine, engineering and astrophysics to the Expedition 58/59 crew. In anticipation of this first assignment, David Saint-Jacques will begin specialized mission training in Russia, Japan, the United States and Canada starting this Summer and for the next two years until his launch. "Eight distinguished Canadian astronauts have been to space, six of them to the International Space Station. These men and women have captured our imagination, motivated us to work and study harder, and inspired us to be our best. 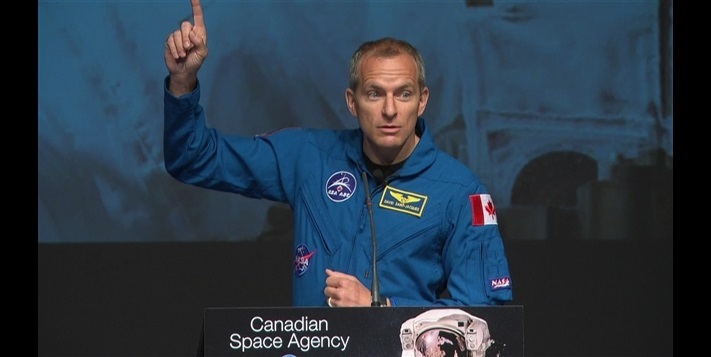 Starting in August our next Canadian astronaut, David Saint-Jacques, will begin training for his mission. He is part of a new generation of Canadian astronauts that will continue our nation's proud history in human space flight and prepare for exploration beyond the Space Station. Our government is proud of its commitment to science and its world class space industry by providing in Budget 2016 up to $379 million over eight years towards the Canadian Space Agency's partnership with the International Space Station," Bains said. "Today, I stand on the shoulders of all the astronauts who came before me. They inspired me—they were my role models. They sparked my curiosity about space and made me want to experience spaceflight for myself. Space exploration is the next step for humanity, and I am proud to be part of it. I would like to thank the Canadian Space Agency for giving me this incredible opportunity. I am humbled to represent Canada on this mission and promise to give it my very best," Saint-Jacques said. Saint-Jacques was selected in May 2009 by CSA and moved to Houston to be one of 14 members of the 20th NASA astronaut class. In 2011, he graduated from Astronaut Candidate Training, which included ISS systems and procedures, spacewalks, robotics, T38-N flight training, field geology training, Russian language, and wilderness summer, winter and water survival training. Saint-Jacques supports the space program through his work with NASA and the CSA, and routinely shares his passion for science, technology, engineering and mathematics (STEM) with young Canadians. After completion of basic training, he was first assigned to the Robotics Branch of the NASA Astronaut Office, then successively acted as Support Astronaut for ISS Expedition 35/36; Lead Capsule Communicator (or Capcom, the Mission Control space-to-ground radio operator) for ISS Expedition 38; Deputy Capcom for Cygnus-1 and Cygnus-2 ISS resupply missions; and Lead Capcom for the Cygnus-3, Cygnus-4 and SpaceX-6 ISS resupply missions. He is currently a Capcom instructor and supports the Visiting Vehicle Operations in the ISS Integration Branch of the NASA Astronaut Office.